Book Of The Week Phantom Skies, Shifting Ground Photographs by Byron Wolfe Reviewed by Blake Andrews After being acquitted for the murder of his wife’s lover, Eadweard Muybridge spent a year photographing along the Central American Pacific Coast. In 2007, photographer Byron Wolfe tracked down, cataloged, and eventually rephotographed every known Muybridge Central American photograph. Through photographic collage, interpretive rephotography, illustrations and essays, this book examines a rare series by Muybridge. Phantom Skies and Shifting Ground By Byron Wolfe. Selected as Book of the Week by Blake Andrews. Phantom Skies, Shifting Ground. Photographs by Byron Wolfe. Radius Books/Temple University, Santa Fe, NM, USA, 2017. 228 pp., 130 color and black-and-white illustrations, 9¼x12". "Bryon Wolfe is no stranger to rephotography. In the 1990s, he cut his teeth as a major contributor to Mark Klett's Third Views, Second Sights project. Klett pioneered the field in the 1970s with Third View's predecessor, Second View, a re-examination of historic western landscapes. Klett's methodology was straightforward. He and his team would locate original photo sites, rephotograph them from the same camera position, then present the new images with the originals as side-by-side diptychs. 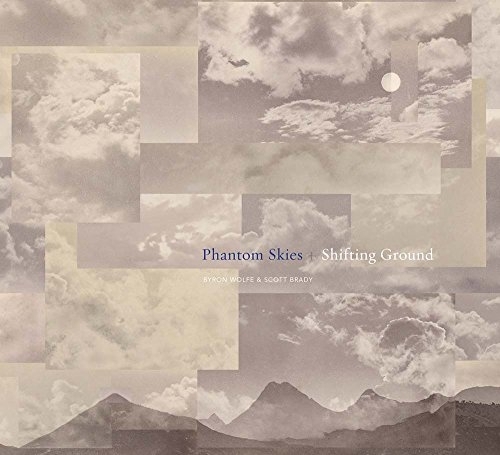 Phantom Skies and Shifting Ground By Byron Wolfe. Radius Books/Temple University, 2017. As time went by, Klett expanded the possibilities, shifting the presentation as he collaborated with Wolfe. They added color images and used modern digital tools to combine historical and contemporary versions into collages and panoramas. This created a more interactive and vibrant relationship between the two timeframes. These techniques all appear in Wolfe’s own rephotographic project, Phantom Skies and Shifting Ground, a collaboration with Scott Brady recently published by Radius Books and Temple University Press. Eadweard Muybridge captured the original photographs, but they are not the California landscapes or animal locomotion series which built his reputation. Instead, Wolfe was drawn to an obscure set of photos that Muybridge took in Central America in 1875. Muybridge had just been acquitted of murdering his wife and needed a reset. He shed his identity, adopted an alias (Eduardo Santiago Muybridge), and headed south. On his trip, Muybridge shot over 250 photos, but the album he produced never attracted much attention. Only a limited number of copies were published, each one unique. Eleven are believed to survive today. The negatives are now lost and none of the photos are very well known. For Wolfe these circumstances were like honey to a bee. After stumbling on a well preserved Muybridge volume, Wolfe became intrigued, then gradually obsessed. He catalogued every known photo from the trip, then sought them out in person. In 2005, he visited Central America to search for the original photo sites. More trips followed, with his colleague Scott Brady joining the hunt. Wolfe quickly realized that most of Muybridge's original photographs were photo-montages composed of multiple negatives. 'What first appeared to be straightforward photographic representations of a thriving post-colonial society,' Wolfe writes, 'eventually emerged as highly romanticized constructions.' The bulk of the constructions consisted of clouds inserted into open skies —Phantom Skies— a common enough practice in the 19th century. It would still be interesting if Wolfe stopped here, but the book he produced goes beyond rephotography. Some photos are presented on their own. For others, Wolfe combines historical and contemporary vistas into multiple-image collages, a technique he first used in the Third Views series.